The third part of Under a Raging Moon is now available, and that means the story is complete!! Piper got free from the werewolf conclave only to find herself in the clutches of the criminals who hired her to steal the necklace. When push comes to shove, she finds she can’t hand over the priceless piece of jewelry and betray Hudson and Kale. But when the criminals go after them, she and her men find themselves on the run, in fear for their lives. They must sell the necklace before the thieves catch up with them. And they must find some way to untangle the confusion of their complicated relationship. 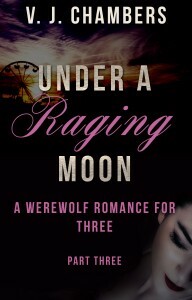 Under a Raging Moon is a serial novel involving sexual and polyamorous content. It’s being published in three parts. This third and final part is 40,000 words or approximately 115 printed pages.